If you live in Malaysia, sometimes it takes 1 hour for a bus to arrive…..sometimes it just don’t show up. If you live in Singapore and you use Singtel, here is something for you. 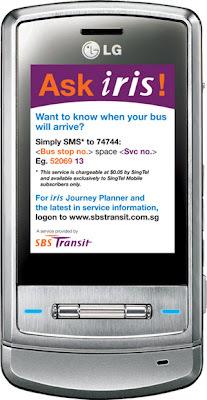 SBS Transit commuters who are also SingTel Mobile subscribers will be able to get real-time bus arrival information on their mobile phones. 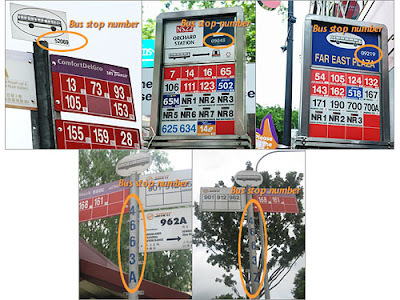 The service which is called iris (Intelligent Route Information System) let users simply key in the busstop number space and bus service number to 74744 and a return SMS will include information on how long it will take for the next two buses to arrive. The service was previously only available on GPRS…. In Malaysia, we were promised 5-15 minutes for a bus to arrive…and we now know how long does the “5-15” minute means. In an unrelated news, Singtel launched its “BroadBand on Mobile” service around 4 days ago. The service which consist of 6 package is offered on the 3.5G(HSDPA) system with speed up to 3.6Mbps. It cost around RM70($31.50) for a maximum 10GB usage with unlimited wifi(Singaporean will be getting free Wifi with or without this package) for the BB on Mobile 512(512k speed) package. The BB on Mobile 1800(1.8Mbps) cost around RM105($47.25) and BB on Mobile 3600 cost around RM175($78.75) both with unlimited wifi with maximum 10GB of data use. IN MALAYSIA, we get ONLY 3GB, after 10-20 minutes disconnection, NO P2P, best effort service, streamyx alike modem with a worst effort speed of 384k for RM66.